Pat Hiddleston, educationalist and mathematician. Born: 9 May, 1933 in Troon, Ayrshire. Died: 8 December, 2017 in Edinburgh, aged 84. Pat Hiddleston was an inspiring educationalist, brilliant mathematician, lifelong adventurer and full-time mother. She rarely took time out of work, continuing at an international level into her final year of life. And she loved every second of it. Pat was born in Troon, Ayrshire, in 1933, eldest child and only daughter of Harry and Jessie Wallace, proprietors of the popular Ardneil Hotel in the Scottish coastal town. 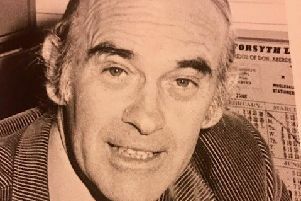 Harry was an infamous local character, generous with his time for friends and with a fondness for the drink, devoted to his daughter and adored unquestioningly by her. He was forthright in his encouragement to her to pursue her love of mathematics, inspired by her school maths teacher, Chuckie Peebles. She was Dux of the ‘wee’ school and then of Marr College and often commented how lucky she was to have been to a pupil there, what a wonderful childhood she and her two brothers had enjoyed, despite the war, developing – as she would throughout her life – close friendships that lasted her lifetime. She was accepted to read Mathematics and Natural Philosophy at Edinburgh University in 1952, graduating in 1956 with a double first class honours degree. Being one of only four women in a maths class of over 100, and the only woman in her final honours class of 15, was not easy. Some of her (all male) tutors refused to speak to her or to acknowledge personally that which they could not avoid doing so publicly: namely that women were equally capable as men within the field of mathematics. In one of her exams she scored 100 per cent. She put her success down to simple hard work and enjoyment of coming first! She was the first woman to be awarded the coveted Napier Medal for mathematics by the university in 1956 despite the prejudice of some of those who taught her. She was a brilliant scholar and could have continued on to Cambridge had it not been for her choosing to accompany the man she loved to Africa. In Pat’s final year at school she had met a young teacher from Kirkcudbright, George Hiddleston. They fell in love and married within a month of her graduation. They applied to the Colonial Office for a posting abroad and were to be sent to Sarawak when, at the last minute, plans changed and after a long cruise to Cape Town and a four-day train journey to the centre of the continent, they finally arrived in Northern Rhodesia. There they remained for the next 14 years, staying well after Independence, developing a deep love for the country and giving birth to their four children, Julie, Trish, Lesley and Adam. While George worked his way up in the service from teacher to a senior role in the Zambian Ministry of Education, Pat set about completing her Doctorate through the University of South Africa, making the two-day train journey in each direction to meet with her supervisor and visit the university library, graduating in person just three weeks after her fourth child was born. She was appointed as the first academic in the maths department of the new University of Zambia. As one of her colleagues noted, she was unfazed by the challenge of devising a syllabus that aimed to raise then rather poor maths students up to a credible degree standard in four years. Her contribution was marked with respect by the university when she celebrated her 80th year. That “there’s nothing I can’t do” attitude was to characterise her life. Pat and George returned to Scotland in 1970 and remained there, raising their family until 1984, whe they returned to the continent both of them loved so much. For most of those years, Pat was the proud, relentlessly hardworking and extremely popular Headmistress of St Margaret’s School in Edinburgh. It is likely that there is not a single former pupil who does not hold a special story of this unusual and unique headmistress. In 1984 Pat accepted an offer to become Principal of Durban Girls College in South Africa at a period of the country’s history marked by the state of emergency and subsequently the dying gasps of the apartheid regime. The school had committed to admitting all races and Pat would be the Headmistress who would introduce and oversee that gradual transition. She threw herself into the politics of that country, joining the non-violent white women’s resistance organisation Black Sash. Pat was relentless in her desire to encourage a multi-cultural ethic in a once-single race school and despite opposing national policies, she achieved it with the support of governors and parents. Her commitment to shaping education in developing countries drew her back to central Africa in 1988 when she was offered a position in maths education at the University of Malawi. They returned to Edinburgh in 1995 where George died a few months later. Though shaken by his loss, she had a close, loving family and many friends and an equally strong love of her work to fall back on. While her peers were considering retirement, George’s loss was to give Pat the urge to embark upon the second episode of her life, an opportunity not many are given and even fewer embrace to the extent that she did. Over the next 20 years, she developed a demanding and successful international consulting career in advising governments on how to encourage girls into science subjects, teacher training and the development of their education curricula. Her geographical impact expanded from her beloved Africa to Asia and to Central and Eastern Europe igniting a fascination for their histories and cultures. Today, millions of children across the globe learn from textbooks she helped write or edit and from the thousands of teachers she helped train and inspire. Yet, all of this was done with utter humility. Throughout Nepal, Namibia, Myanmar, Ethiopia, Ghana, Cambodia and Vietnam, amongst others, she would sit with her local counterparts on the ground, ride on the backs of motorbikes, take local buses on precarious mountain roads, stay in the same hotels or guesthouses and eat the same food as her local colleagues and never think anything of it. She loved her work, the countries she served and the people she met and worked with, and that, for her, was all that mattered. She was still working at the age of 82 in Bangladesh, when she became ill in early 2016 with what was to be later diagnosed as ovarian cancer. Continuing with her work despite medical advice to the contrary, she confronted the illness with the same dogged and steely determination that had served her throughout her career and refused to allow it to hold her back. She was hugely appreciative of the care she received and constantly sang the praises of our NHS. Pat died surrounded by her family, in her own bedsurrounded by the mementoes from around the world that gave testament to a life that was truly lived to the full. A memorial for Pat Hiddleston will be held at the Mansfield Traquair Church in Edinburgh at 3pm on Friday 26 January to which all who wish to attend are very welcome.